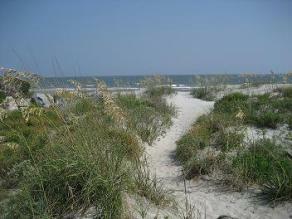 Charleston offers 6 of the top beaches in South Carolina. Nowhere else in the state will you find a wider range of beachfront real estate – whether you’re looking for a secluded island setting, a private beach resort, a surfers’ haven, a historic barrier island, or a beach home within minutes of great shopping and restaurants. Our Charleston Real Estate expert Agents can help you find the perfect beachfront home in no time! Call (843) 532-8615 to start your Charleston Beachfront home search. The most affordable Charleston beachfront homes can be found at Folly Beach, which is known for its laid back style, surfing competitions, and colorful atmosphere. Isle of Palms is also comparatively affordable but features a more upscale feel along with a larger selection of newer homes. The northern end of Isle of Palms is gated off for Wild Dunes resort. This real estate market is ideal for buyers wanting the best of all worlds – a private oceanfront setting with top notch amenities (including 2 golf courses designed by Tom Fazio, highly ranked tennis facilities, and a full service marina), all within a 5 minute drive to the shopping, restaurants and movie theaters of Mt. Pleasant. Sullivan's Island offers some of the most unique beachfront homes in South Carolina. In the late 1800’s, Charleston’s most well-to-do families would leave their city or plantation houses to summer on the island. However, its history goes much further back than this. Its location at the mouth of the Charleston Harbor made it an important vantage point for the Revolutionary War. The colonists at Fort Moultrie used logs from palmetto trees which withstood cannon fire much better than the brick fortifications (which is why South Carolina’s official nickname is the Palmetto State). In the late 1820’s, the writer Edgar Allan Poe was stationed at Fort Moultrie, adding more interest to Sullivan’s Island. All 4 of these beaches – Isle of Palms, Wild Dunes, Sullivan’s Island, and Folly Beach – are located within a 10-20 drive of historic Downtown Charleston. If you’re looking for a more secluded beachfront home and don’t mind driving 45 minutes from the city, Kiawah Island and Seabrook Island are both private beach resorts with a full line of amenities. Seabrook Island is unique in that it features an equestrian center and allows horseback riding on and around its beachfront. When comparing Kiawah and Seabrook, most home buyers choose Kiawah because its amenities are world renowned. In fact, the 2012 PGA Championship was held on its Ocean Course, and it’s been ranked the #1 Greatest US Tennis Resort by Tennis magazine. Keadle Real Estate is here to help you find your dream Charleston Beachfront Home! Enjoy a more map oriented search? Search Real Estate Charleston by map view!